Beautiful, Clean Two Bedroom unit available for weekly spring/summer rentals. We just recently installed Mitsubishi Heat Pumps so units now have air conditioning. Enjoy a short walk across the street to the beach (100 yards) and also the quiet sunsets of the bayside while you cook your dinner on the grill on the deck. North Side Unit - two bedrooms, one and a half baths, upstairs deck off master bedroom, living room, kitchen, dishwasher, cable TV, washing machine, dryer, gas grill, sliding glass doors to deck off of living room. Tout était parfait: la propreté, l’accès à la plage, la tranquillité. Et en plus, nous avions droit à la télé en français (Radio-Canada, Sherbrooke). C’est vraiment une location à recommander. This apartment is situated overlooking an estuary and a block from the ocean. The apartment is clean, well appointed, with very comfortable beds. There are two bathrooms, two balconies. The place comes with lots of supplies, even kayak to use. Dave and Con is are welcoming and helpful. What a find. Comfy with a great view! Perfect place for a friend's getaway. The house was comfortable and casual, made it really easy to relax. The view from the deck was beautiful and when you get bored with that, it's a 2 minute walk across the street to the beach. My daughters and I stayed here in the North Side unit in the fall and it was an amazing location. Great views off both decks. We loved watching the birds in the marsh! The cottage was modern, homey, very clean and amazingly well equipped. The kitchen has everything you could ever need! Loved having the washer and dryer, Cable TV and the WiFi. The beach is just across the street. Dave, the owner, was wonderful and extremely helpful. He knows the area inside and out and can give great suggestions for dining options. Next time we can get back to Wells we hope to stay here again. Thanks for taking the time to write a review for Baywatch. We are happy that you enjoyed yourselves after flying in from Colorado. September and October are great months in Maine. There are so many events, Fall fairs and activities throughout the area. We hope you will be back to stay with us soon. We love it when people enjoy the bay as much as we do. My wife and I stayed here in the North side unit in early June of this year. I was born and grew up in the area and over the years have stayed many times at Wells and Moody Beach, sometimes on Atlantic Ave. I love the ocean and had never stayed on the tidal river side before, always on the beach side. Our stay at Baywatch changed my mind, and we are booking now again for next June. This is a wonderful property, and we loved the North side unit, two levels, each with a balcony. 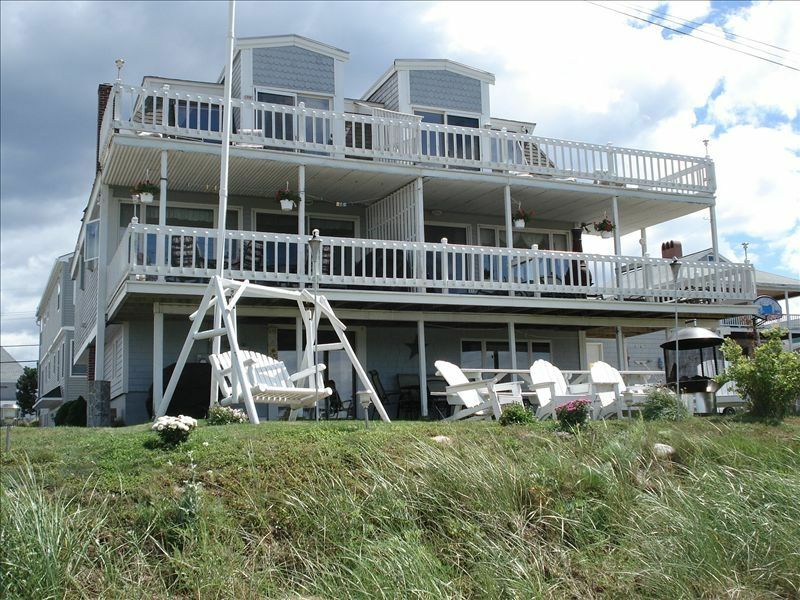 The views in the evening are terrific, sunsets and the tidal river and Wells harbor. The owners are genial, very pleasant and extremely helpful. I thought I knew the area well, but Dave recommended a great restaurant that I hadn't heard about. The unit is just as described, very clean, very bright and cheerful with all the amenities, wireless internet, cable tv, an excellent, well equipped kitchen. We walked on the beach every day (3-4 minutes walk onto the beach from the property), and enjoyed watching the birds near the balcony, and the seals playing in the river. It was a great week, and we'll be back as often as we can. Thank you so much for your review. We really enjoy meeting new people as well as our returning friends who rent year after year. Connie and I were very fortunate to find this house on the bay 15 years ago. After spending hours on the beach, we love returning to the calm waters of the bay to kayak, fish or just relax. We know that many people spend the entire year looking forward to their week vacation in Maine so we do everything we can to provide the amenities to make it feel like home. We are very happy to hear that you enjoyed your stay at Baywatch. Best location we have stayed at by far! We have stayed on Atlantic Ave in Wells for years and have tried several locations. The Baywatch was so gorgeous - we hated to leave! The accommodations far exceeded my expectations. Everything we needed was at our fingertips, and clean and great condition. It didn't feel like a rental, more like we were staying at someone's home. The owners were so friendly and courteous - and the other tenants and neighbors were just as lovely. I felt as though we had been there for years, instead of only 1 week. The views are amazing, and for rainy days, the home was so comfortable, we actually joked we wished for more rain and less sun this vacation! It truly felt like a home away from home. Great place for kids and adults alike! Can't wait for next year!!!! Thank you for your complimentary review. We love sharing our home with other families, especially those who love our home and Wells Beach as much as we do. We have the best of both worlds, the ocean across the street and the bay in our back yard. Like you, we had stayed on Atlantic Ave. and loved the ocean. We had never experienced the bay until we bought the house. It has opened up kayaking, boating and fishing, not to mention just relaxing at the end of the day to the flight of the birds, the sail boats drifting by and the fabulous sunsets. We have the best of both worlds and love sharing it with such appreciative people. We look forward to seeing you again next summer.